We’re on to the SWEET SIXTEEN in the Denver Burger Bracket! The match-ups are getting tougher but we’re determined to find a winner! We choose the winners in the bracket and YOU vote for your favorite burger in our “People’s Choice” polls. Top vote getters will be in the final “People’s Choice” poll along with our final match-up. In the end we’ll crown Our Winner and a People’s Choice Winner! 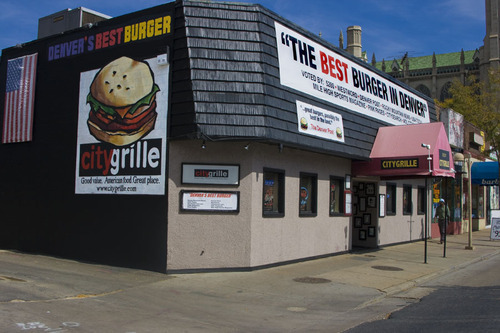 City Grille took down Smashburger in the opening round of the Denver Burger Bracket, but was one of the few contestants who lost convincingly in the People’s Choice poll. Probably because Smashburger is a big national chain compared to just one location, but I’m also guessing that not many people have had the chance to eat one of their delicious burgers. It’s hard to miss with all of the “Best Burger In Denver” signs, but I’ve still gathered that there are many of you who have yet to try a City Grille burger. Let me tell you, you’ve been missing out. It’s probably the juiciest burger in the bracket, and the ciabatta bun is perfect for holding in all those juices. Combined that with it’s classic burger taste and ridiculously good and buttery grilled onions, and it’s a truly winning burger combination. Hamburger Mary’s on the other hand won almost by default in the first round. 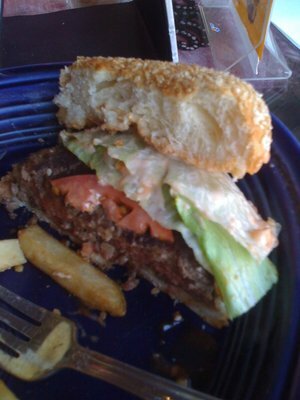 Nevertheless, their wide range of burgers will satisfy anyone’s burger cravings on any given night. That combined with some great entertainment make for a fun night had by all. The crazy combinations of toppings just seem to work though, albeit they’re sitting on top of what I would call an “adequate” burger patty. Not bad of course, just not quite up to the level of some of the other burger patties in the Denver Burger Bracket. City Grille takes the victory a bit easily, but will face the powerhouse in Park Burger in the Elite 8. Enter your email address to follow The Denver Food Guys and receive notifications of new posts by email.